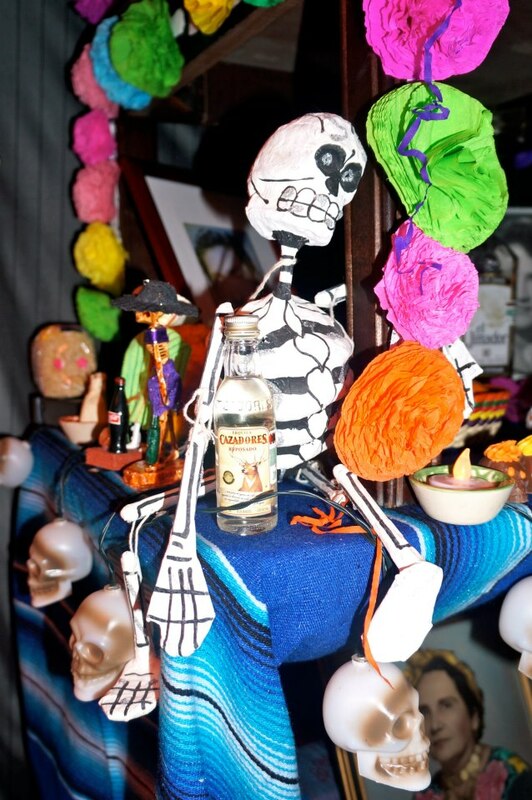 Last week, on November 2nd was Dia de Los Muertos or Day of the Dead – which is one of Mexico’s most vibrant and fascinating holidays. 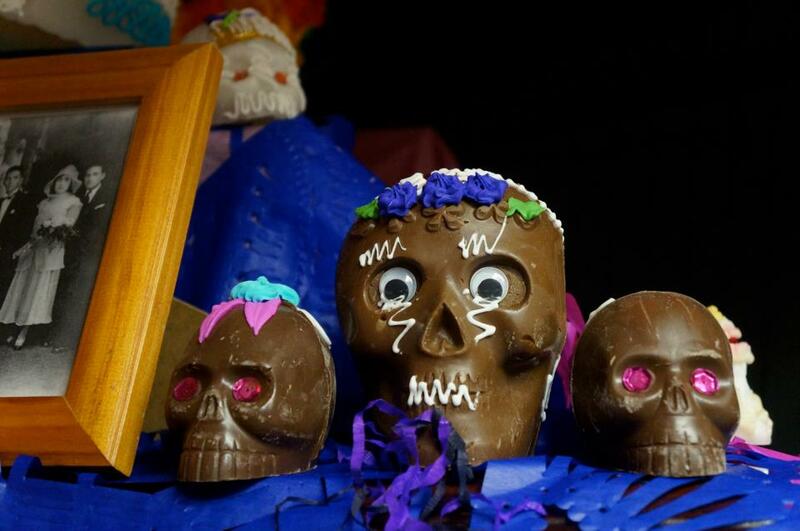 It’s an amalgamation of pre-hispanic beliefs, merged with Catholic traditions, but ultimately it is a time to celebrate and remember the life of your deceased loved ones. Last year C and I went to San Angel during Dia de Los Muertos, and saw some fantastic alters – you can see the post and pictures here. 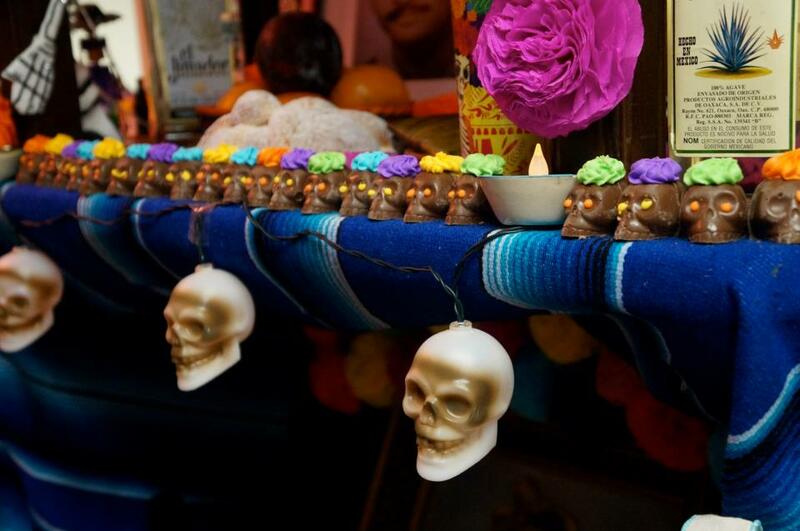 This year, I had a far more personal experience with Dia de los Muertos, as we made our own alter in the office. With the help of my lovely colleagues I felt as though I got to understand the tradition of the day that much better, and to appreciate them. What started off as a competition for the best decorated office in the Embassy, turned into quite a personal experience for me. Traditionally an altar is made up of 3 levels which represents Earth, Purgatory and Heaven. 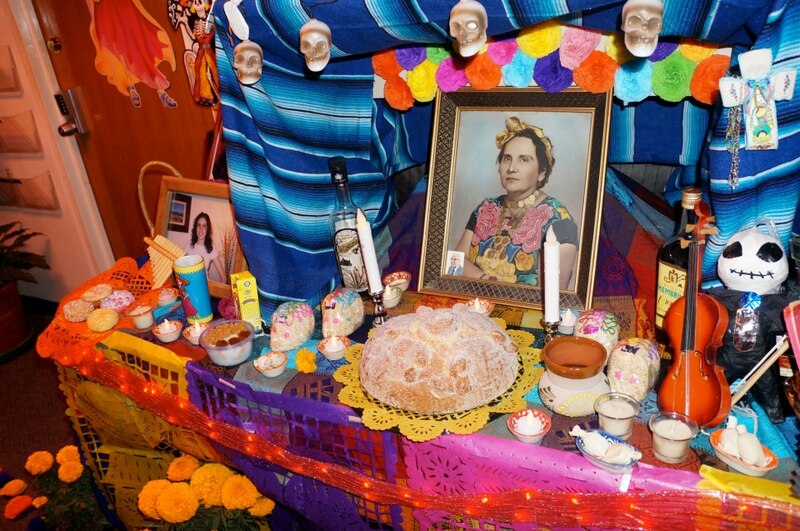 On every altar pictures of your deceased loved ones are set up, along with offerings such as pan de muerto (bread of the dead) which you can see in the center of the table, their favourite foods, candles to light the way so the dead know where they are going, fruit and of course a good bottle of tequila…all this travelling is thirsty business! 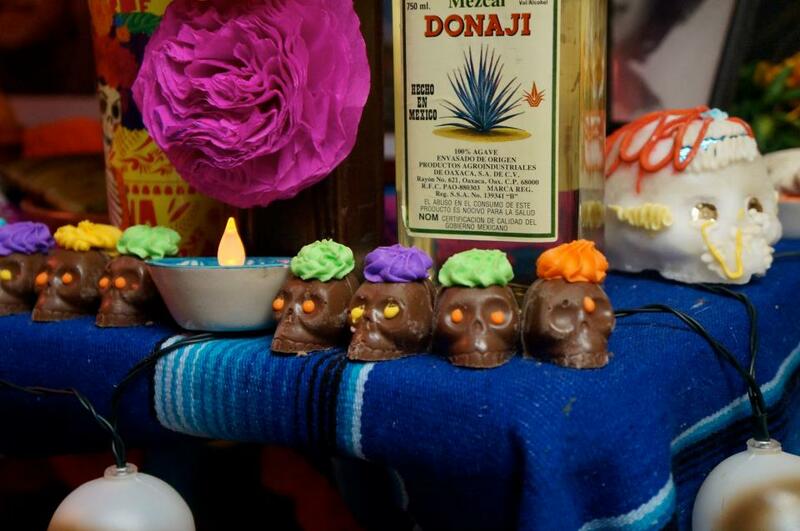 The sugar or chocolate skulls are a must on any altar, but they are also given as presents to people during this time – as a reminder of the inevitability of death and as a representation of the afterlife. In the bottom corner of the large frame in the centre – you can see a little passport size photo. That is a photo of my grandfather or Morfar as we called him. As he was never one to turn down a good party, I thought that it was only fitting for him to be up there as well. While we were constructing this altar, and everyone was putting up photos of their deceased loved ones, I found it very moving. I got to hear little stories about the people in those photos, whether they were grandparents, parents, children or nieces – for this day, we spoke about them, we remembered them, we got to know them and we celebrated their life. Although I don’t necessarily belive that their spirits will come back to earth, I do love the idea of putting aside one day a year to truly think about and remember the people we love. I always felt very close to my grandfather – yet apart from keeping a photo of him in my wallet as a little reminder I don’t celebrate his life or really think about him. After helping to construct the altar last week, I found myself for the first time since he died, really thinking about him. How he used to giggle at his own jokes, how he loved to eat chocolate while he watched TV in the evenings, the smell of toast and coffee coming from his kitchen early in the morning, the way he would repeatedly rasp his knuckle on any hard surface – which irritated my grandmother no end! Somehow it felt comforting. Mexico has given me so many amazing things, and this tradition is one of them. 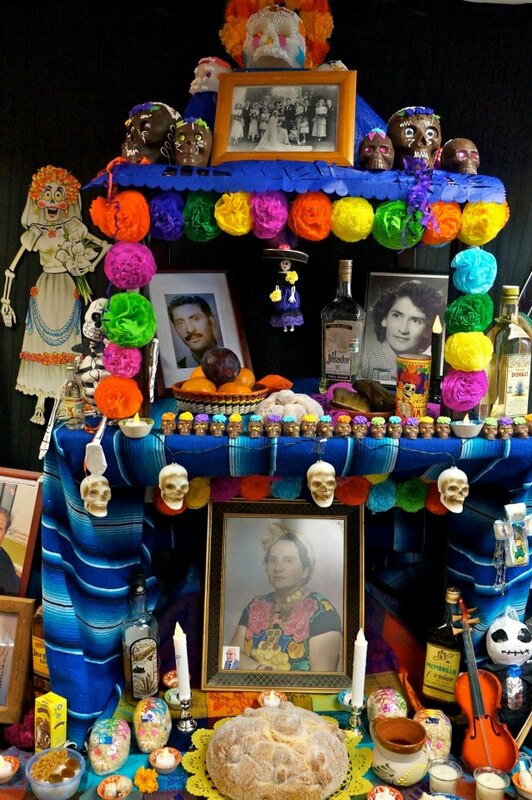 When I leave Mexico I hope to continue this tradition, I may not construct such an elaborate altar as the one above (I doubt I will find such an abundance of skull artifacts in our next post!) but just set up a little table somewhere with a few candles, a few momentoes and set some time aside to remember some of the people most important to you.